PBCB Family Members Sail in 470 Junior World Championships! 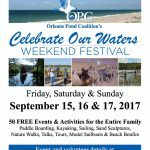 The Orleans Pond Coalition’s “Celebrate Our Waters” Weekend Festival will be held September 15, 16 and 17. This weekend, filled with free events, centers on the beauty of our waters. Enjoy many activities and learn how to become a steward of our valuable natural resources. Choose from more than 50 activities for the whole family, including kayaking, paddle boarding, sailing, nature walks and tours, model sailboats, and a beach bonfire! Have fun and learn how we can all become stewards of our valuable natural resources! And PBCB is joining in the fun by offering sailing with our instructors! Information on the sailing opportunities will be available at the festival. Festival headquarters is located at Depot Square, Old Colony Road, in Orleans. Here you can gather information on events and register for sailing. Click here for more information on the festival. Hope to see you there!